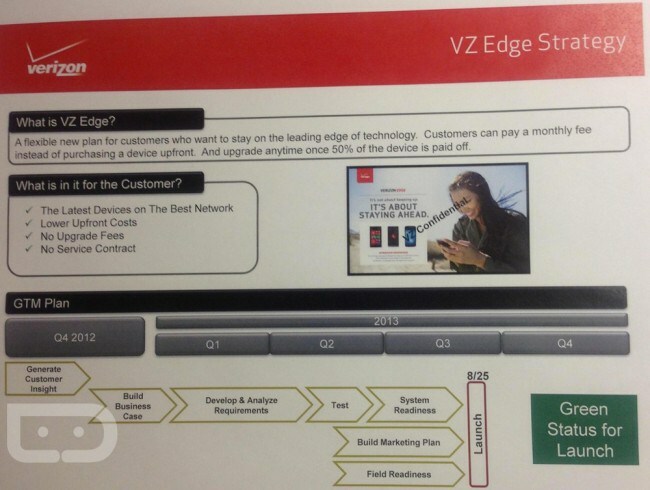 Following T-Mobile's recent announcement of its new "Jump" phone upgrade program and its "Uncarrier" policies, a leaked document (via Droid Life) suggests that Verizon intends to introduce a similar "VZ Edge" program that will allow Verizon customers to purchase phones on a monthly payment plan that will include upgrade capabilities after half of the device purchase price has been paid. Though details on the upcoming changes are scarce, the document implies that VZ Edge will function similarly to T-Mobile's Uncarrier program, letting customers purchase unsubsidized, off-contract phones via a monthly payment plan. T-Mobile customers can purchase devices like the iPhone 5 by offering a downpayment and a device fee of $21 per month. With the Jump add-on, customers pay an additional fee to access twice yearly upgrades. Verizon's "flexible new plan" promises the latest devices, lower upfront costs, no upgrade fees, and no service contracts. Currently, Verizon only lets its customers upgrade on a 24-month basis, after contracts have expired. It is unknown what Verizon intends to charge per month for the plan, but more information should be available on August 25, which is the program's scheduled launch date. All thanks to Tmobile. Competition is always good. Is it just me or are all of these early upgrade plans horrible, horrible deals? Why don't people realize they can get 300+ for their one year old smartphone and then use an early upgrade to get the newer ones for 400 or so? 300 is conservative. iPhone 4s are still 350ish online used. No contract plans are plain BS here in the US. They might seem cheaper, but I bet if they only offer this type of program then by a year, all their plan prices will be hiked to the same prices we are paying now w/ contract plans and we will have to pay for a phone fee on the side so even more money to their pockets and no lost or quotas from phones sales. I hope AT&T jumps on board too. I like to continue to upgrade my iPhone each year. Look closer at the deal. This is just Verizon more or less double dipping. It would be one thing if the plans were lower but instead they keep the plans the same rip off level and now making you pay full price for the phone. Verizon isn't giving people any "discounts" in their monthly plans. People need to see the big picture. Verizon isn't about saving money. It's about increasing guaranteed monthly revenue from customers. And it's post paid. Which means u will keep paying the higher prices regardless if you pay off your phone or not. Do the math. Verizon will basically put u on a phone leasing program with no benefit of lower monthly cost on voice and data after the phone is paid off. No matter what they offer, they still fall way short of what European carriers offer. Eventually, US carriers will get there, but they'll get there kicking & screaming. I don't necessarily agree. Most Americans are on family plans which offer huge savings. Only those on 1-2, maybe 3 lines pay too much. Especially single line users on post paid carriers like att and verizon. But my "average line" cost with my family plan is $35 a month. And this includes a phone subsidy upwards to $400 per 24 months on each line (that's upwards to a $2000 subsidies on phones). I can get phone and immediately resell it for profit and cancel data if I don't use a smartphone. That extra line only cost me $10 a month cause my mother only needs flip phone. So people will be paying for a subsidized device (included in the jacked up monthly screw everything plans), pay a monthly fee for this new upgrade thing, and on top of it pay full price for their phone (or lease forever if they choose to upgrade). Verizon is going to laugh all the way to the bank. I wonder if those with unlimited data plans can take advantage of this. The average customer has no idea what the true value of their phone, iphone or android is. And most ppl i talk to may not feel comfortable selling it on ebay, or craigslist etc. So these retailers offering trade in programs, and low balling the customer towards the price of a new phone are making bank. And the customer is so naive they think they are getting a deal when they trade their phone for a new one. This program will seem like a deal to your average Joe. They wont comprehend they are getting screwed in the process.